Rats make excellent loving pets but as with any animal they will suit some people more than others. No animal should be taken into a home that is not prepared for it or cannot give it the care it deserves and the following section is dedicated to making sure you are right for rats as well as that they are right for you. Rats make excellent pets, once you’ve had a rat you’ll never look back and are most likely hooked for life. They’re always there to welcome you when you come home, small furry bodies pressed against the bars in excitement. They happily bound out of the open door for playtime and spend hours making your heart race with there dare devil stunts or happily snuggling up for a hug and calmly washing you. Of all the small animals I have owned or cared for (and I’ve covered most of the common ones and some less than common) nothing responds to you with the same joy and attachment, but that first decision must be made carefully as with any animal. The following should provide a brief idea of if you are right for rats. Are you Right for Rats? You want a pet that will learn to know you and value you companionship. You’d love an active prankster to keep you entertained or a cuddly chum who’s there when you need them. You are prepared to spend the required money to set up your rats (see later sections) and keep them in good health and happiness. You are happy to get your rats out for at least 1 hour a day and give them lots of love and attention. You have thought about who will look after you rats when you go away on holidays or if any other emergency situation comes up. You don’t mind the odd bit of damage to your house, clothes or things. Your happy to clean your rat out as often as it requires it (this can range from once a week to every fortnight for small groups in big cages) and feed and water it once a day. You can cope with the idea that this beloved pet that you will become so attached to will most likely die before it’s 3rd year (sad but unfortunately true). You live in someone else’s property, either rented or a parent/friends and they won’t allow you to have pets or you suspect this might be the case (always check first, and get it in writing, it saves heart ache later). You want the pet for your young children and haven’t got the time/interest to look after them yourself and supervise their play. You are not prepared to care for and take the time necessary for you rat. You want an animal that requires little time or input. This mainly revolves around the size housing you buy (see the habitat section for more information on what is suitable). The prices given are approximates based on mid to cheap ranged products available at the time this book was written and those suitable for 2 or more rats as this is the minimum that should be kept (see later). Only those items that should be bought at minimum are listed, much more could (and is likely to) be spent by the enthusiastic new owner. Food – this is generally not massively expensive unless you have a lot of rats. Prices vary depending if you mix your own or buy a commercially available mix (see the feeding section for more info), though your typically looking at £2.50 - £4 per kg for adult rat dry food (a bit more for kittens who need more wet protein). Added on to that you need to make sure they get regular fresh veg which can add up. Treats – These again range depending on what you choose. Ranging from quite expensive pet shop bought treats to food left-overs and veg off cuts which are essentially free. Litter – This is fairly cheap in general though some of the more absorbent cat litters can get quite pricey if you have a lot of cages and you cover the whole floor. Generally if you can buy locally and store in bulk you can save a lot of money (e.g. 1 bale of cardboard bedding at £8.50 can last up to 3 months for one reasonable cage). It can be hard sourcing the best litters locally however most are available online, but this does add to the cost, typically coming in at around £15-20 for a large bale. Bedding – This again ranges widely in price, from petshop bought nesting material to torn up newspaper which is essentially free. Toys - Depending on how creative you are this can end up costing a lot (if you discover those dangerous online rat and pet shops) or free/material costs only for those items you make yourself. Hammocks and other luxury items – as above. Health Foods and Health Products – diet can play such a part in our rats life that often when they are ill, elderly or just need a bit of something extra you can shop around and get a lot of dietry supplements and additions (like herbs and spices) that can help support immune system health and any condition there suffering from. These can be quite pricey and are easy to get carried away with. Hygiene and Grooming Products – rats are very clean animals, however it can be nice for the owner and rats to occasionally brush their rats, these are very much an optional expense though and are relatively cheap, with a human nit comb being one of the best rat combs you can get. You will also need to clean the rats out regularly and will need something to clean out the rat cage. Price wise this can vary from the expensive (cage cleaning antibacterial wipes) to the cheap and effective washing up liquid in warm water. Investing in some value toothbrushes can also help with cleaning. Medication can also add up however you don’t need to get the medication off your vet. Good vets will often point out cheaper alternatives in human medicine from your local chemist and there are also an increasing number of websites where you can buy animal medication providing you get a prescription from your vet. Rat Damage – This varies from rat to rat, some rats will not take to chewing and some will chew anything with a ferocious determination and various stages between. This can lead to a fair bit of damage when rats are allowed to roam unsupervised in none rat proofed areas and will generally at minimum involve the odd nibble hole in your jumper. You also have to bear in mind some chewers have a habbit of breaking out of plastic based cages so always check your cage bases before you have an escape. G.M.R. – Otherwise know as Get More Rats, any rat owner can suffer from this though it can be held in check by the strong willed or those banning themselves from entering pet shops or visiting breeders/rescues WebPages. 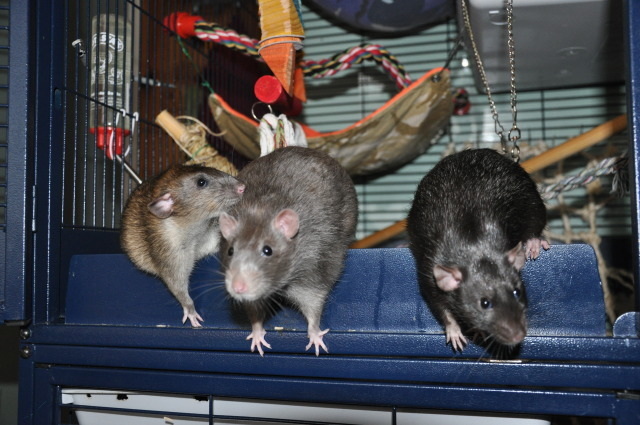 It generally involves escalating costs such as buying new and bigger cages, additional basic costs and the occasional round of vet bills from introduction battles (rare as long as introductions are careful but can happen – see behaviour - introducing new rats). Spoilt Rats Syndrome (SRS) – This happens to all but the most hard hearted rat owner and is often linked to G.M.R. Pockets will quickly begin to empty as hammocks fill the new bigger and better cage and rats are fed on an assortment of culinary delights with special health foods added. Soon the rats will have there own room and be chauffer driven to various interesting show venues. Showing Rats – This can start small with the cost of driving to shows and renting show tanks but may soon escalate to travelling around the country visiting various shows and breeders to get the next beautifully bred rat, splashing out on an assortment of grooming and fur care products and being assaulted by the latest ratty merchandise at each show. Quite often by this stage the temptation to start breeding your own future show winners creeps in and costs can shoot even higher.